TRINIDAD, Feby. 20.—All going well, there is every likelihood that T.A.F.A. will visit Jamaica early in December next. The Association in that centre have undertaken to finance the tour, so anxious are they to receive the visit, and there's no reason why this good-will tour should not be undertaken. 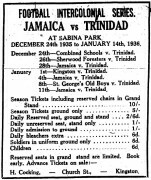 It is well known that the standard of play in Jamaica is high, and such a trip will be of immense benefit to the game in Trinidad. More, the knowledge that the trip will materialise must make for keener play in the T.A.F.A. competitions. Players who are the probables and possibles for selection will vie with each other for supremacy on the field of play in an endeavour to catch the eyes of the selectors and get places on the side, and this will naturally be reflected in the takings at the gates which, automatically, will increase. Jamaica is hardly linked up with the other West Indies colonies in the realm of sports, and such a tour will make for cementing the bonds which should exist between us. And while it is early, one hopes that for such an occasion the T.A.F A. will be fully represented. Capt. Cuthridge, if he can find the time ought to be one of the party. As President of the T.A.F.A., his presence in Jamaica will go a long way in bringing about some working arrangement whereby regular visits could be instituted at periods of say once every three or four years, such year not to coincide with the year during which a tournament will be held. And matters will be fittingly concluded if E. A. Hinds, 'Father Hinds', as he is popularly called by all members of the T.A.F.A., accompanies the side in his well-known capacity as Manager.